The Macedonian dynasty ruled the Byzantine Empire from 867 to 1056, following the Amorian dynasty. During this period, the Byzantine state reached its greatest expanse since the Muslim conquests, and the Macedonian Renaissance in letters and arts began. The dynasty was named after its founder, Basil I the Macedonian who came from the Theme of Macedonia which at the time was part of Thrace. Claims have been made for the dynasty's founder being of Armenian, (hence the dynasty is also referred to by at least one author as the Armenian Dynasty) Slavic, or indeed "Armeno-Slavonic" descent. 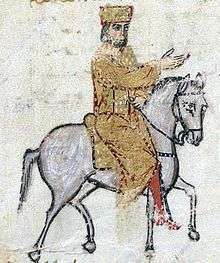 The author of the only dedicated biography of Basil I in English has concluded that it is impossible to be certain what the ethnic origins of the emperor were, though Basil was definitely reliant on the support of Armenians in prominent positions within the Byzantine Empire. Wikimedia Commons has media related to Macedonian dynasty. ↑ Peter Charanis.Studies on the demography of the Byzantine empire: collected studies Variorum Reprints, 1972 p223(360):"Thus, every emperor who sat on the Byzantine throne the accession of Basil I to the death of Basil II (867—1025) was of Armenian or partially Armenian origin. But besides the emperors there were many others among the military and political leaders of Byzantine during this period who were Armenians or of Armenian descent"
↑ Tobias 2007, p. 20. Tobias is referring to the writings of Hamza al Isfahani, a 10th-century Arab scholar. ↑ Finlay 1853, p. 213.